Schaff what ?. 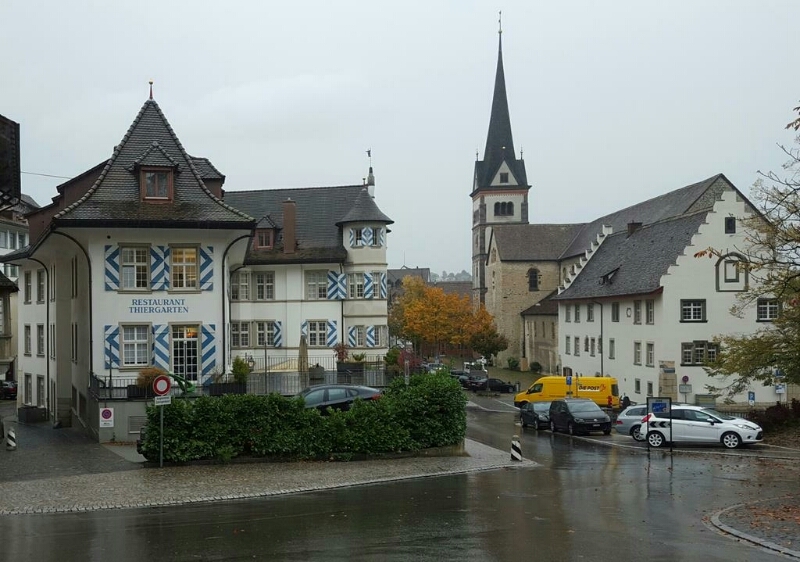 Well, a picturesque village in northern Switzerland, and 46 minutes away from Zurich. One of the most beautiful rural areas of the country, where fall was astonishing splendid. Grey, yellow, green brown. Looking out of the train window, that was taking me there, the landscape was glorious. On the bank of the Rhine, it was a disputed town, with a rich tradition of river trade, since the Middle Ages. 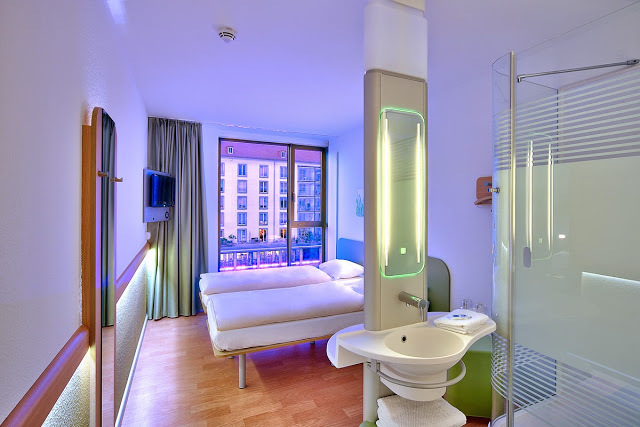 There’s something you should do before starting your visit. 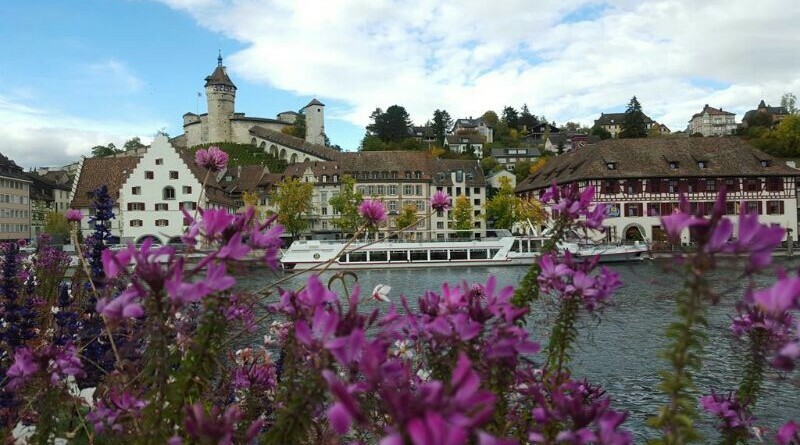 Crossing the bridge in Freier Platz, and admire the most typical view of Schaffhausen. The bridge itself is flanked by dozens of flowers. Howadays, just over 35,000 inhabitants live in the town, making it a particularly quiet and monumental town, at the threshold of Germany. Its station is a major hub; German trains and buses enter the city. 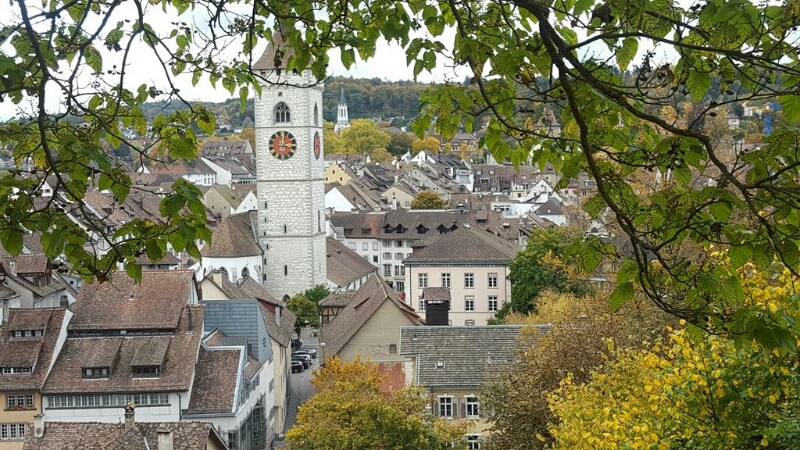 This proximity made it to be one of the few Swiss cities which suffered from an American attack in World War II, due to it was confused with German territory. Today, if we look at its impressive pedestrian historic center, and thanks to the millions of dollars in compensation for the error, there’s not any trace of that fateful day in1944. Let’s go back to present days. If we go for a walk there are five things we should do. The gates and Munot fortress. 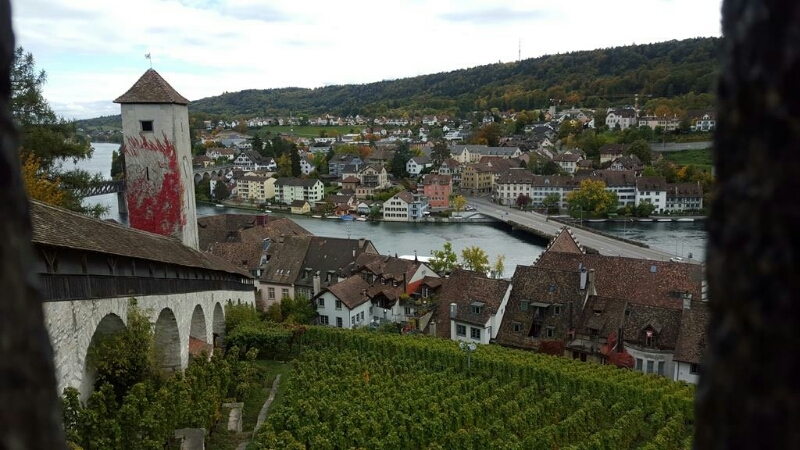 One of the most picturesque round fortress in Switzerland, on top of a hill, surrounded by vineyards; there’s privileged view of the rooftops of the city. It is the quintessential tourist icon of the city. You can climb up the steps, or take the bus number 4 from the station, stopping at Künzelsheim. There’s not too much inside, but it is interesting the spiral staircase to the highest point. The city has not walls any longer, but there are still towers-gates in the old city defensive system. The Obentor, Schwabentor, and Diebsturm. 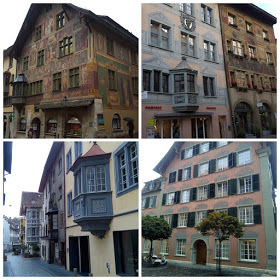 The historic town has quaint squares, usually former medieval markets; now places to see and be seen. In each corner, there is a succession of ancient fountains always decorated with flowers, and statues. Two in Vorstadt and Frogwagplatz. Usually with statues of soldiers. 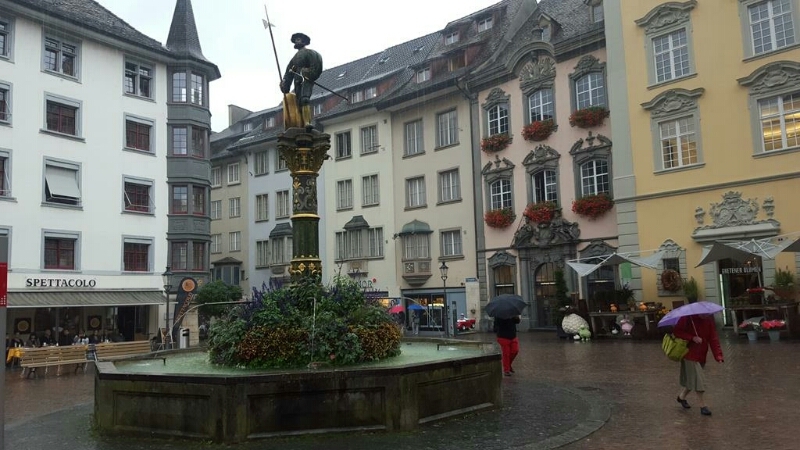 The one at the end of Vordergasse is the most famous of the city, and is crowned by a statue of William Tell. There’s another one in Platz with another soldier, and a shield of the city. Old Buildings with colourful murals. The city is packet with historic buildings, almost intact and many with balconies; some decorated beautifully with large impressive murals on their Fassades. It’s like a kind of outdoor Sixtina Chapels. The outstanding star, is the Haus Zum Ritter in Vordergasse. 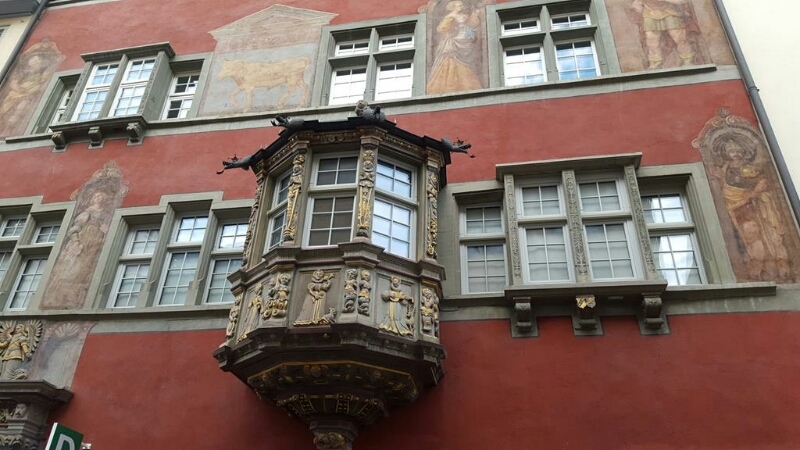 Built by the noble Hans von Waldkirch in 1566, the facade is decorated with paintings of the famous Tobias Stimmer. Renaissance paintings depicting allegorical, religious and military scenes. It is a kind of an open book to his own glorification. There are two main ones, both especial but spartan. The first Saint John, dating from the thirteenth century, in the old fish market square. The other one we shouldn’t miss with its 34-meters tower, is the cathedral. 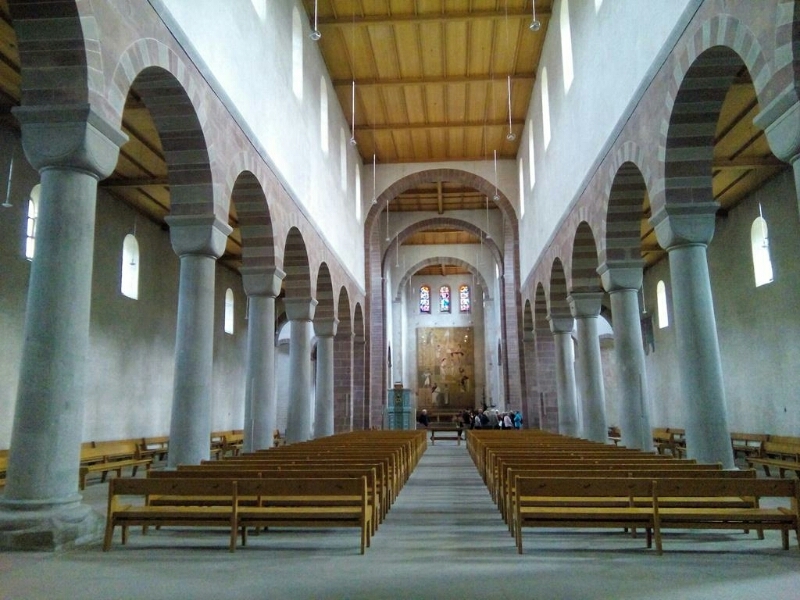 While the outside is one of the most beautiful sleek towers and facades of Switzerland, the interior is devastatingly austere despite its dimensions. It has a beautiful cloister and a small botanical garden by the monastery cloister. The main museum of the city that is inside the cathedral complex, offers an interesting collection of artifacts from different sources. Religious art, archeology, paintings etc. As other places in Switzerland, there a place which assembles high quality watches. It’s called IWC, and also offers an interesting clock museum. Switzerland is particularly expensive, where a beer can cost 5 euros, a cafe more than 4. Set menus for 30, and sandwitches around 7. The food is nothing outstanding and the German influence is clear in its gastronomy. Sausage, meat, “swimming” in mountains of cheese. Don’t think that fondue is something universal in all Swiss geography. Gruyere is far away, and it’s more typical in the French-speaking area. 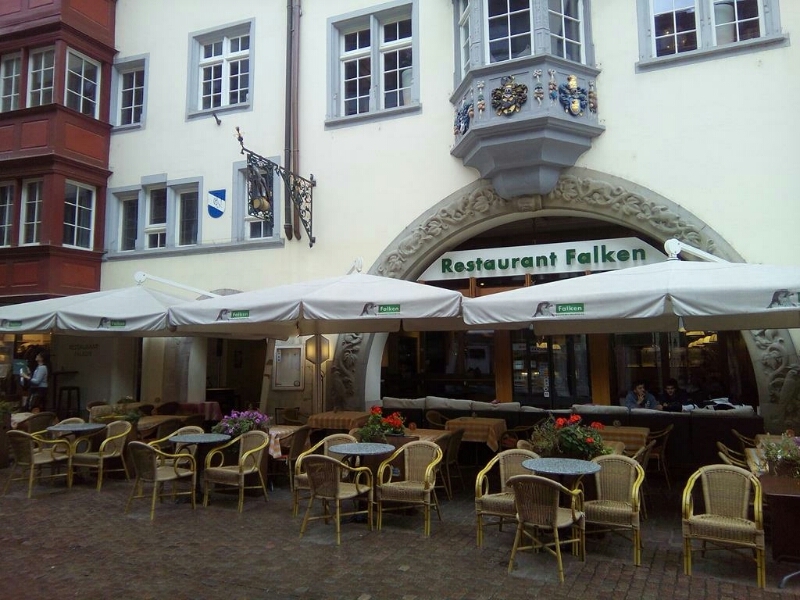 One of the local highlights is the Falken Restaurant which is also a typical beer brand. The fondue for two people costs 50 euros, and you should not leave without trying the Rösti, a local baked potato omelette. 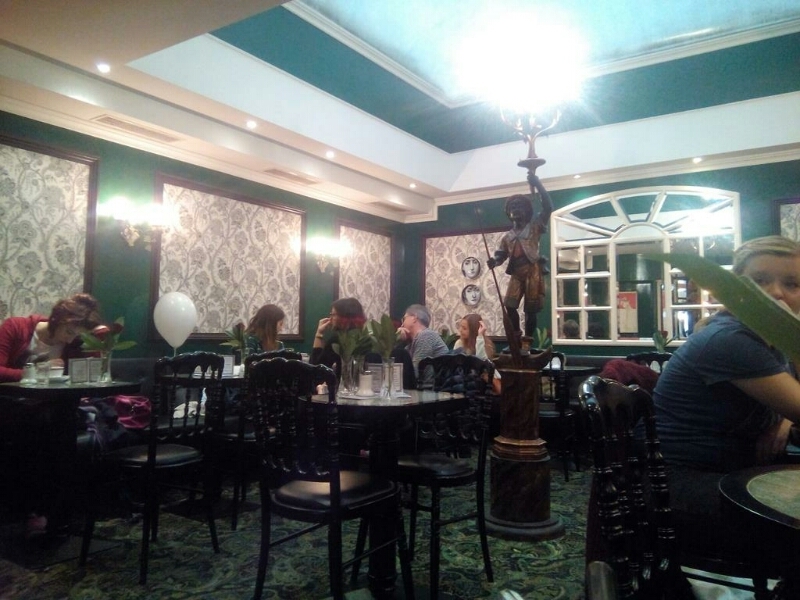 I love old fashioned cafés. The traditional central european style one is the Vordergasse Café. Do not expect it to be cheap, and the decor is an impossible combination of wallpapers, colorful rugs, and classic artifacts. It’s a decadent place but lovely indeed. 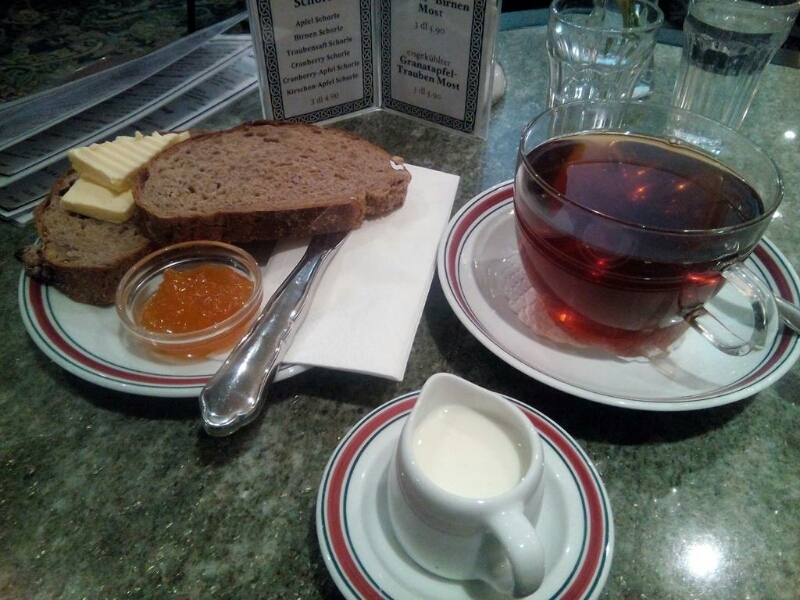 Yes; an ecological Swiss bread toast and tea will cost you about 10 euros. Outrageous costly. We arrived in Schaffhausen on the S16 train, directly from Zurich Airport in aproximademante 46 minutes, and running every hour. Each ticket costs 20 euros.